At Mahar Dental, we believe that you deserve the very best in oral health treatments. One of the ways that we can bring value to our patients is by offering some tooth replacement options. Losing teeth can be very difficult for a variety of reasons. Eating and speaking become difficult, and you lose self-confidence when you know your smile doesn’t look as good as it once did. Dental bridges are one of the best ways to replace teeth permanently. We can use your natural teeth or a dental implant to support your dental bridge. A dental bridge is a permanent dental prosthesis that can replace 1 to 4 consecutive missing teeth. If you have a row of missing teeth, a dental bridge can fill the gap in a way that will allow you to eat and speak as you did with your natural teeth. A dental bridge is made to look just like your real teeth. 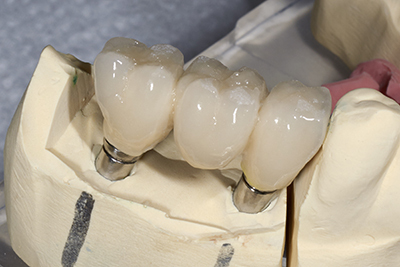 Because the prosthesis is made to look like a row of teeth, each “tooth” will be connected to it’s neighbor to enhance the strength of the prosthesis. • Maintain facial shape. When you lose teeth and do not have them replaced, your face can have a sunken appearance. This is one of the major factors in the loss of self-confidence. • Fill space of missing teeth. Missing teeth are an annoyance and a burden. It can be hard to eat without teeth, and your speech can change dramatically. • Prevent remaining teeth from moving our of position. Something that many people do not realize is that teeth are held in place by their neighboring teeth. When a tooth is lost, the neighboring teeth will have a natural tendency to drift into the space that is left behind. When teeth shift, your bite can change, which can lead to all sorts of additional oral health issues. • Restore chewing and speaking ability. A dental bridge will allow you to eat and speak as you did before losing your teeth. • Upgrade from a removable partial denture to a permanent appliance. Removable appliances are great, but they also require much extra care that permanent appliances do not. A fixed bridge is a big step up and a significant bump in quality of life. While we can mount a permanent dental bridge to your natural teeth, we prefer to anchor them to dental implants. The reason we prefer dental implant supported bridges is a natural tooth must be significantly altered to support a fixed bridge. A dental implant allows us to restore health to your mouth and avoid permanently altering your natural, healthy teeth. Receiving a fixed bridge requires at least two trips to our office to achieve. The first trip we will take impressions of your mouth that will help us to create the dental bridge. We will also prepare your mouth to receive the bridge, whether that means placing a dental implant or altering your natural teeth. On your second trip to our office, we will affix the permanent bridge in your mouth and ensure that it fits into your bite properly.